The F-Type is a stylish sports car from Jaguar starting with the shark mouth like grille in the front. The lines move up from either side of the grille flow above the fenders and then fuse with the door and wheel wells and the door handles go flush once once the luxury sports car is in motion or locked. The rear looks wide and powerful and the rear spoiler lifts or deploys once you hit 75 mph / 120 km/h . Jaguar F-Type’s interior is molded to an aircraft cockpit , Jaguar calls this “one-plus-one” cabin. There is a vertical grab handle in the center of the instrument panel which goes down to center console, it effectively kind of separates the cabin into two seating areas. In addition, to the grab handle and staying to the aircraft cockpit theme, there is a joystick (common on planes) which is the SportShift selector, which controls the eight speed transmission that drives the rear wheel. Also, for shifting there are orange colored paddle-shifters. Other interior features includes a 196 liter trunk which can hold 2-3 bags, not your golf set unfortunately. 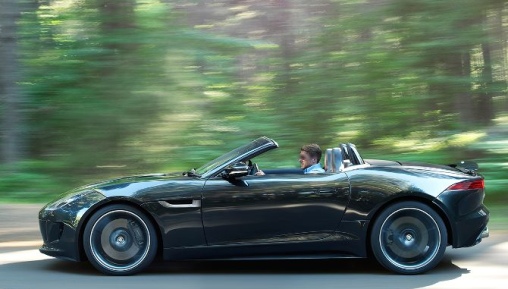 The base engine driving the 2014 Jaguar is a 3.0 liter supercharged V6 pumping out 340 hp with 332 lb/ft of torque that propels the F-Type to a maximum speed of 155.34 mph (250 km/h). 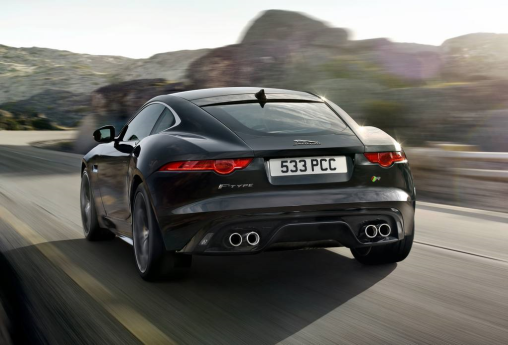 The F-Type S has more power with 380 hp and 339 lb/ft of torque and a top speed of 170.88 mph (275 km/h). If you decide to go for the fast Jaguar F-Type you can buy, then the 5.0 liter V8 S motor can push out 495 hp and 461 lb/ft of torque with a top speed of 186.41 mph(300 km/h). If you want to go like stink, then the 2014 Jaguar is for you. You can accelerate from 0-100 km/h in 5.3 seconds with the F-Type, if you are pressing the gas pedal for the F-Type S model however, then you can do 0-100 km/h in 4.9 seconds. Now, if you are in the top of the line F-Type V8 S then you are doing 0-100 km/h one second faster at 4.3 seconds. From the back of the sports car you will notice two large exhaust tips that are shaped like trumpets and the exhaust tone sounds aggressive when the engine is revved. Now, if you want to stop listening to the exhaust just rolled up the windows, put the convertible top up (if you got a Roadster model) and turn on the option $1500 700-watt Meridian Surround Sound stereo system, this will drown out what little external noise and give you crisp clear music with exceptional bass. 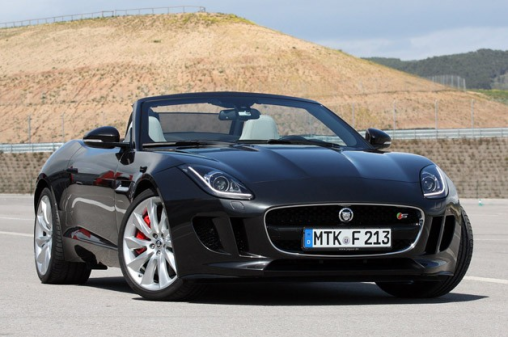 If you want a powerful luxury sports car with superb styling then the 2014 Jaguar F-Type might just be for you. If its aggressive styling, fast acceleration and fun to drive handling you are sure to enjoy taking this puppy out on a nice sunny day.